As a follow up to Elevator-Gate, there's been a debate about gendered epithets at atheist blogs. I keep reading about forbidden words. Meanwhile, I've got a lot of forbidden words blaring in my ears, thanks to my 14s playing a lot of Watch the Throne, the new Jay-Z & Kanye West album (love this song, though it's a racist-sexist-word-fest). 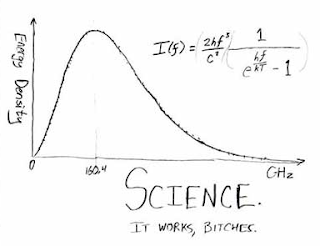 Then I saw this comic, which seems designed for the hip-hop lovin' scientist, male or female. Please, don't tell me I can't laugh.